Every generation has had its breakthrough that promised to, at long last, finally cure cancer, but this time around the chances of actually pulling it off are looking pretty good. Rapid advancement in fields like genetics have led to incredible success using immunotherapies to turn patients’ own bodies into cancer-fighting machines. Pharmaceutical companies, philanthropic billionaires and the federal government’s cancer moonshot program are all racing to develop new treatments, with a handful already approved. But for some, progress cannot come soon enough. Running short on time, dying cancer patients are concocting do-it-yourself versions of highly experimental cancer therapies, without the oversight of doctors or regulators. Without expectation of survival, any therapy—no matter how untested, unproven or potentially unsafe—offers a glimmer of hope. In 2015, Elen’s husband Vlad was diagnosed with an aggressive form of lung cancer caused at least in part by a genetic mutation. Months of surgeries, radiation, and targeted drug therapies did little to slow the growth of tumors. The cancer spread to his brain. Doctors concluded that there was little left to do except help Vlad die comfortably. Then came the smallest splinter of hope, in the form of a newly published academic article passed along to Elen’s brother, Jo, by someone online. A small study in China had found modest success using an experimental immunotherapy to treat the exact same cancer that Vlad had in a single 85-year-old patient. The patient died from cancer-related complications in his liver, but before that the authors wrote that the immunotherapy vaccine had caused a “rapid and dramatic regression” of cancerous tumors in his lungs. There was just one giant, crater-sized hitch: It wasn’t a treatment you could buy, nor one you could join a clinical trial to test out. The treatment was a one-off, designed for one person in one very early-stage study. So with the blessing of Vlad, Elen and Jo decided they would have to make their own luck—and their own immunotherapy. Far-fetched may be an understatement. The immunotherapy Elen and Jo sought to recreate was what’s called a peptide vaccine, strings of amino acids intended to trigger the body’s own immune system to home in on cancerous tumor cells and attack. Interest in immunotherapy is booming, and for good reason: The medical literature is filled with incredible stories of tumors suddenly shrinking to nothing and terminal illnesses miraculously reversing course. But there are also significant hurdles to developing working immunotherapies, and just as often they produce only modest success, devastating side-effects or flat-out don’t work. The long odds facing Elen and Jo were clearly spelled out even in the paper that had given them hope: The researchers wrote that they expected most patients would not respond as well as their subject, and that the study was mostly intended to guide future research. When contacted for this story, the Food and Drug Administration noted that there is not a single peptide vaccine approved in the US to treat cancer, though there are more than a hundred listed currently in clinical trial. “The self-medication of experimental products without the advice of a licensed physician amplifies the safety concerns at best, and at worst, prevents or interferes with more proven treatments,” an FDA spokesperson told Gizmodo via email. Besides, it seemed simple enough: For a few thousand dollars, they could contract a lab to manufacture the right peptide, and they could get everything else they needed either at a local pharmacy or online. How hard could it be to mix it all together? It is not unusual for patients to become experts on their own diseases—for better or for worse, the web has freed medical knowledge from the silos of med schools and academic journals, giving us all access to the same information our doctors might consult. There are now countless online communities where patients trade tips on treatment. Recently, patient groups have even begun funding their own academic research and drug development for rare diseases that other investors typically ignore. Elen and Jo are at the vanguard of what is perhaps the next logical—if extreme—step: Do-it-yourself cures. Susanna Greer, the director of clinical research and oncology at the American Cancer Society, said Jo and Elen’s story was heartbreaking. “It sounds like this would have very, very little chance of working,” she told Gizmodo. It is unlikely that one single peptide would do much to slow the progression of cancer; a single peptide corresponds to just one mutated amino acid sequence in a tumor, but many clinical currently in progress combine several different peptides corresponding to multiple different tumor mutations in order to trigger a stronger attack. Peptide vaccines, she further explained, often require combination with other treatments to help them work, and right now science is still at the point of figuring out what the best combination of other treatments is. One promising avenue, for example, includes peptide vaccines used in concert with treatments that inhibit the immunosuppressive signaling happening in a tumor’s immediate environment. Steinar Madsen, the medical director of the Norwegian Medicines Agency, said that the Norwegian government was aware of the DIY cancer vaccine movement and that while it has chosen not to take action against it, the movement is still alarming. Do-it-yourself treatments exist in a tricky ethical arena that tests the limits of how much agency we are willing to give patients in making decisions about their life and treatment. Increasingly, it is the view of mainstream medicine that when a person’s life is on the line, they should have the right to engage in high-risk treatments. Last month, the US Senate unanimously approved a bill that would allow terminally ill patients access to drugs that have gone through preliminary testing on humans, but not yet gained FDA approval. Similar right-to-try laws have already been passed in 37 states, some of which allow even patients with serious but not terminal illnesses to try experimental drugs. The right-to-try movement has its roots in the HIV epidemic of the 1980s, during which people diagnosed with the then little-studied virus sometimes acquired experimental drugs illegally. Before right-to-try laws, US patients only had two legal pathways to accessing experimental drugs once other treatment options had been exhausted. They could seek out a clinical trial, which only accept a small handful of patients and often include health requirements that terminally ill patients cannot meet. Or they could petition the FDA for access to drugs via its “compassionate use” program. Sometimes, there is also a third, illegal option: Order the drugs on the internet from another country where they’re already legal. Recently, a study found that this tactic had led to a measurable decrease in London’s HIV rates. But right-to-try laws contain built-in protections to theoretically make sure that experimental therapies are not taking advantage of dying patients desperate for a cure. The Senate bill requires the FDA to receive safety reports from patients trying the drugs and forbids drug makers from charging more than the cost of production. 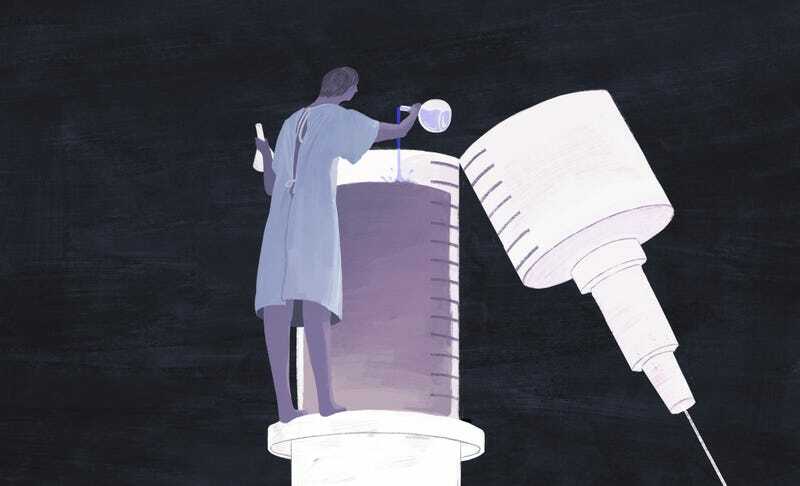 Even then, critics worry that right-to-try laws could undermine the clinical trial development process meant to ensure drug safety and potentially harm patients. Many drugs that pass the Phase I of trials with the FDA have minimal efficacy data and later do not meet the requirements of approval. The peptide vaccine that Jo and Elen are making has not even gotten that far in any nation’s approval process. Chances that it will work are scant. Eleonore Pauwels, a bioethicist at the Wilson Center, pointed out that there is a rich history of self-experimentation in medicine. The first human heart catheterization, for example, was performed by a doctor named Werner Forssmann on himself in 1929. But Forssmann was a doctor, with medical knowledge and training. “When people start injecting themselves or other people with DIY experiments, they are crossing a line. You don’t have accurate insight into whether it will work or whether there will be side effects,” she told Gizmodo. Pauwels said she found the DIY cancer vaccine guide “kind of scary.” While it says at the outset that patients should not consider it to be medical advice, it clearly is intended to encourage terminal patients to consider the DIY route. Arthur Caplan, a bioethicist at NYU Medical Center, said that while it’s unlikely the vaccines described in guide will work, it’s more likely that those barely-tested treatments could distract patients from other experimental treatments that might work. It could also provide opportunity to snake-oil scammers looking to profit. “When you open the door to this there are too make people trying to take advantage of desperation to make money,” he said. At the same time, Pauwles said, when other options run out, people should not have to be consigned to death. For Elen and Jo, the confidence to make their own vaccine came from crossing paths with Lars Søraas, a fellow Norwegian whose wife has the same non-small cell lung cancer as Vlad. His wife, Dyanne, was diagnosed in March 2015 with stage IV lung cancer at age 30. Søraas’ brother, though, was a doctor, and with his help they scoured the world and the internet looking for promising treatments, eventually stumbling upon a professor in Germany involved in a “personalized peptide vaccine” project. In Germany, doctors have much more freedom than those in Norway to administer experimental treatments. Søraas was lucky to have the access to medical help and the financial means to send his wife to Germany for treatment in a hospital. Dyanne regularly visits Germany for injections, and the family has tracked the progress of their efforts on a blog, which gradually evolved into a Facebook community for people with the same diagnosis. So far, Dyanne is doing well, but she’s also receiving a much more sophisticated peptide vaccine than the one outlined in the DIY guide, along with other treatments. Elen and Jo at first sought out a similar path to Søraas. They wrote to researchers working on immunotherapies for Vlad’s cancer, hoping one of them would help. They got good advice—it seemed the therapy described in the paper was a match for both the cancer Vlad had and his HLA type, a gene system important for the ability of immune cells to recognize and respond to cancer. But the scientists they corresponded with were busy and it was clear that enlisting their help would take significant time. Meanwhile, Vlad had exhausted all the standard treatments and his condition was getting worse. They were hesitant at first. With the help of many people both in the scientific community and the patient community, they found a lab that they could get to manufacture the peptide they needed for about $1,000. They ordered the stuff to mix it with from a pharmacy, a phosphate-buffered saline solution in which the peptide would dissolve. The pharmacy also supplied them with what’s known as an adjuvant, in this case a cream that when applied to the injection site would hopefully help boost the efficacy of the vaccine. Hope arrived in a tiny vial filled with white powder, carefully packed in a styrofoam box. Elen works at a hospital, and with the guidance of a lab tech there they borrowed a lab to mix it all up. In August, Elen administered the first injection, and Vlad has gotten one every week. After there were no discernible side effects from the first one, they were relieved. “We know he’s been stable for this time, but we don’t know whether it’s the vaccine,” Jo said. The DIY vaccine is not the only therapy he’s receiving—he’s also taking a drug commonly prescribed in Norway that targets his specific genetic mutation. “You want to hope that it could be something that works, but you’re also very careful because you know that there’s no guarantees,” said Jo. Right now, Vlad has no mobility of his legs because of the cancer spreading through his brain. They hope that the vaccine might stop the cancer from spreading, but fear that at this point they are simply too late. Pauwels, the bioethicist, thinks that the course Elen and Jo are taking is likely to become more and more common in the future. She said that she’d like to see more examples of websites like Crohnology, a patient-powered research network for people with Crohn’s Disease to share information about their treatment. Sharing stories of what worked for individual patients, she said, may be a better route that publishing DIY guides to help people make informed decisions about what’s best for their own health care. Josiah Zayner, a biohacker who has helped several people including the Søraas family figure out a way of accessing immunotherapy treatment, disagrees that infrastructure—or even safety—are necessary. Zayner wants patients like Vlad to be able to access treatments that might fail to make it past clinical trials because they’re effective in only a minority of patients. If a treatment genuinely works in, say, two out of 10 patients, that’s typically not enough to pass regulatory muster. But the truth is that regulations can keep both potentially helpful and potentially harmful treatments out of people’s hands. The same drug that worked in two people might also result in devastating, life-threatening side effects in the other eight. Zayner just wants people to be able to decide whether to take on that risk themselves. Zayner said he receives at least one email a day from dying people hoping he can help them DIY a cure. Often they have illnesses he has never heard of. Almost always they are scared, desperate and running out of other options. He knows that there is nothing he can do to help the vast majority of them. All he can do is offer his suggestions for what he might do in their position. It is profoundly, utterly heartbreaking. Zayner doesn’t want people who read the DIY vaccine guide to have the illusion that it will cure them. But can you empower someone without giving them too much hope that they can order a few things off the internet, mix them up in their kitchen, and save themselves? A Facebook group started for the DIY cancer vaccine guide is filled with posts from people trading tips on how to make their own vaccines, with people inspired by Jo and Elen hoping that a novel, scarcely tested treatment may be the thing that saves them. False hope seems inevitable when the point is to provide dying people with options when the reality may be that they have none left. As a medical physicist, Elen used to help design radiation plans for cancer patients. She said that she remembers passing on making plans for patients that seemed like they only had a year or two left. There were just too many patients, and they couldn’t make fancy treatment plans for all of them. It seemed like a waste of resources to spend energy on patients for whom there was little hope left. Elen thinks about that every week when she delivers Vlad his vaccine at the convalescent home where her dying husband now receives 24-hour care. The chances it will work, she knows, are slim. For one, she said, he’s on a lot of steroids, which suppress the body’s immune response while the vaccine is intended to stimulate it.